Many of the bloggers who are writing for paid posts are feeling the sting of not having a good Alexa ranking. In Alexa, the lower your ranking, the better. I have blogs that have over one millionth position and the lowest I have is around 70K. It is a frustrating thing to many because advertisers still look at Alexa rankings eventhough one can easily manipulate the position if they know how. I shall not teach you how to do that because I myself am not seeing very good results with my test. Maybe one day. Meantime, you can Google for it. This is just a frivolous thing I was doing when I was bored. I checked my Alexa ranking and found that one can buy a t-shirt from zazzle.com with the personalised print. A close-up of the t-shirt. It costs USD26+ and I would have ordered one if my ranking is below 10K. 73K is nothing to be proud of yet. 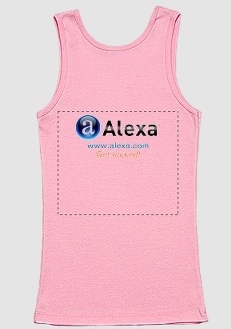 Check your [tag]Alexa [/tag] ranking and get yourself a t-shirt if you like it. The link is provided somewhere on Alexa page. While you are there, go compare ranks with your peers. It is wicked, I tell you. I do that sometimes, checking my traffic and ranking with those sites that are on par with me. Don’t worry, it is good to be a little competitive sometimes. As a motivation to improve our blogs. It’s too demoralising to look at my alexa rankings. I would get one if the t-shirt will update my site’s ranking, which will never happen. At least will not until the day I die.